Currently there are no phone apps similar to SOTA Goat or Rucksack radio, for park activations. So park activators are relying on the goodwill of park hunters to let other people know that they are in a park. 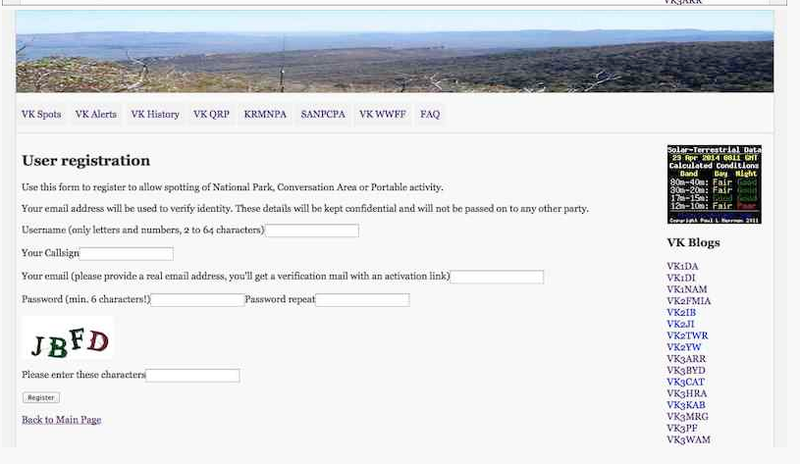 As a result, activators and hunters are relying on other methods, such as setting up an SMS group (which I have done). This is a great way to let fellow park hunters know that you have just worked a park activator. I see that many park hunters have also been using the VK5 Parks Yahoo group or the WWFF Australia Yahoo group, and this is another good option. The DX cluster can also be utilised. However, a terrific tool that many people still do not appear to be using is the parksnpeaks site which has been developed by Allen VK3HRA. parksnpeaks can be located at….. The parksnpeaks site is FREE to join. Just simply register a new account. The ‘captcha’ feature is used to ensure that you are a ‘real’ person. Shire information (only VK3 at this stage). SOTA to Victorian LGA lookup. The SOTA to National Park lookup lists, marry up those SOTA summits which are located within a qualifying WWFF or KRMNPA National Park. This is an excellent resource. So, PLEASE…..start using the parksnpeaks site. A lot of work has gone into it. 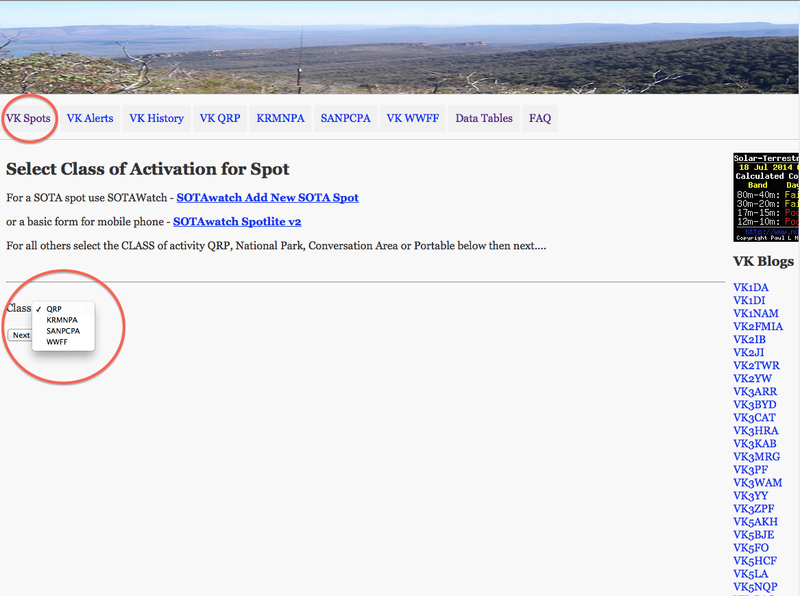 I know that many park activators and hunters do use the site, and find it to be a terrific resource. 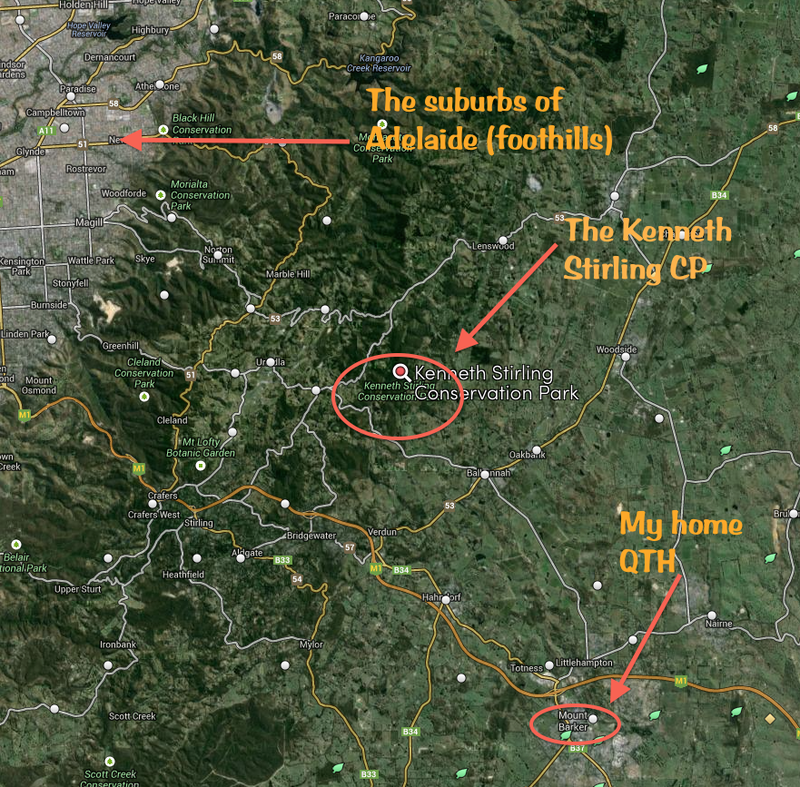 Last Sunday (6th July 2014), I headed out to activate the Kenneth Stirling Conservation Park, which is located near Carey Gully in the Mount Lofty Ranges ‘Adelaide Hills’. It is just a short 19 km journey from home. I last activated this park in May last year when I stayed til just after sunset, and worked some very interesting DX on 40m including New Zealand and Norfolk Island. 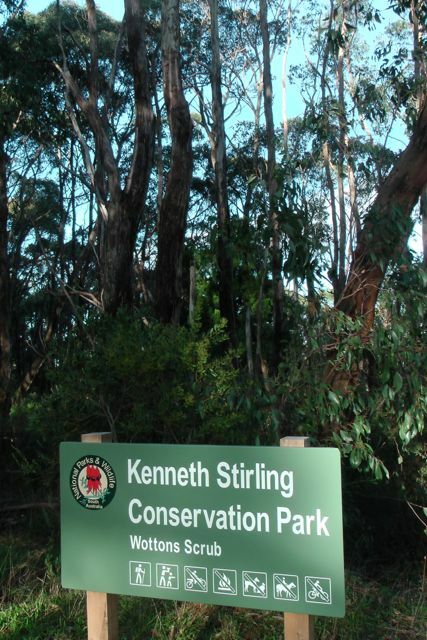 This park has a very interesting history and was named after Kenneth George Stirling. 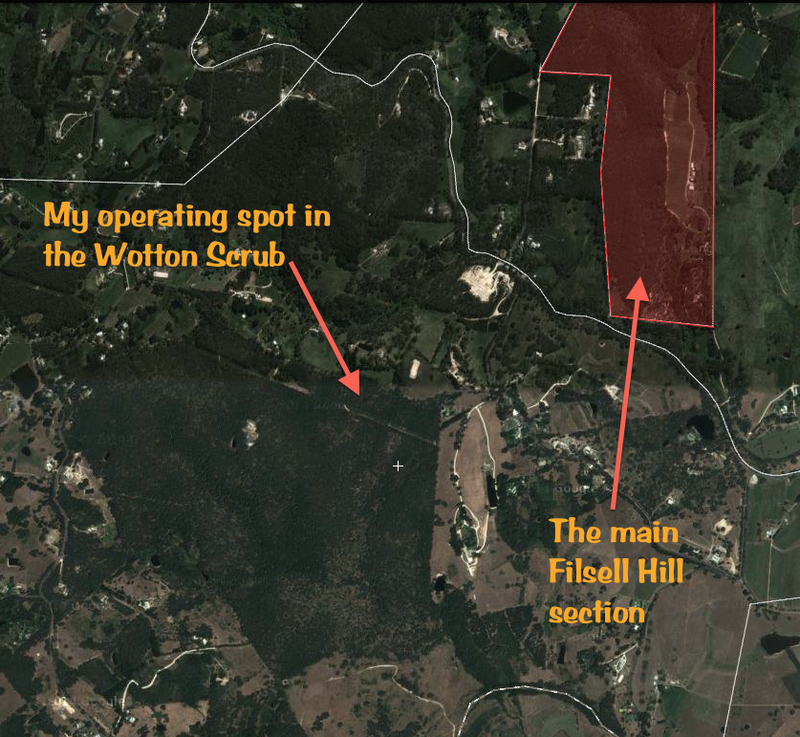 For more information, please see my previous blog at…..
And the Australian Dictionary of Biography at…..
As per last year I activated the Wotton Scrub section of the park, just off Gum Flat Road. This park consists of 4 separate pieces of scrub. Some of the others seem a little more difficult to get to, so I played it safe, and activated Wotton Scrub. Next time I’m going to try the other sections. Filsell Hill, which is the largest of the four sections has limited access passing through private land to the park entrance. Access into White Scrub and Burdett Scrub is limited, as there are no walking trails or vehicle tracks within the reserves. There is a carpark off Gum Flat Road with plenty of room for a number of vehicles. From there it is just a matter of walking through the gate into the park. There is a 4WD track at this location, but is is only accessible to official vehicular traffic such as DEWNR, CFS, etc. In an event, the large gate is locked which prevents vehicle entry. I set up about 20 metres in from the gate. There is plenty of room here to stretch out the legs of the dipole, following the 4WD track. I tied the ends of the dipole off to some of the nearby gum trees and set up my fold up table and deck chair. 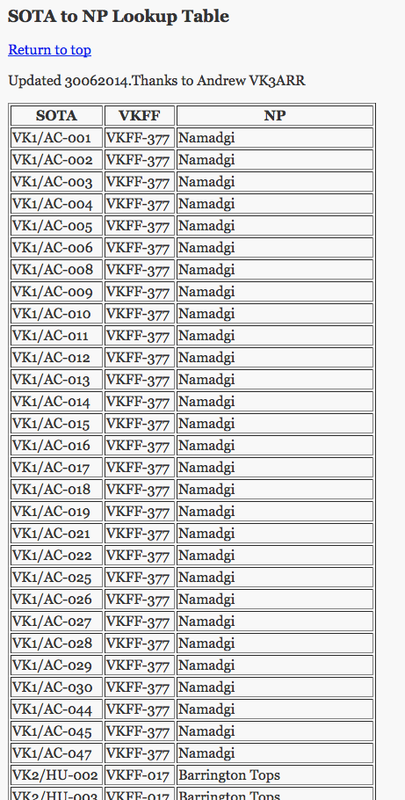 As per recent activations, I again used the Yaesu FT-450, and my linked dipole, and ran 40 watts. I started off on 40m on my promised frequency of 7.095 and my first contact was with Peter VK3PF who was running QRP 5 watts. Peter had a very nice 5/9 signal coming into the park. 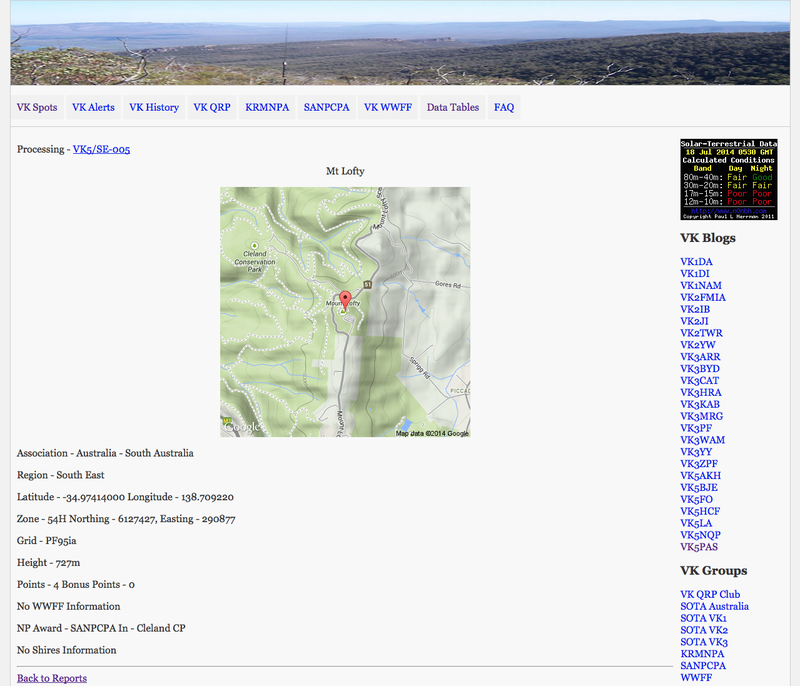 This was followed by Matt VK1MA/3 who was on SOTA peak Mount Dandenong VK3/ VC-025, which is also located in the Dandenong Ranges National Park. 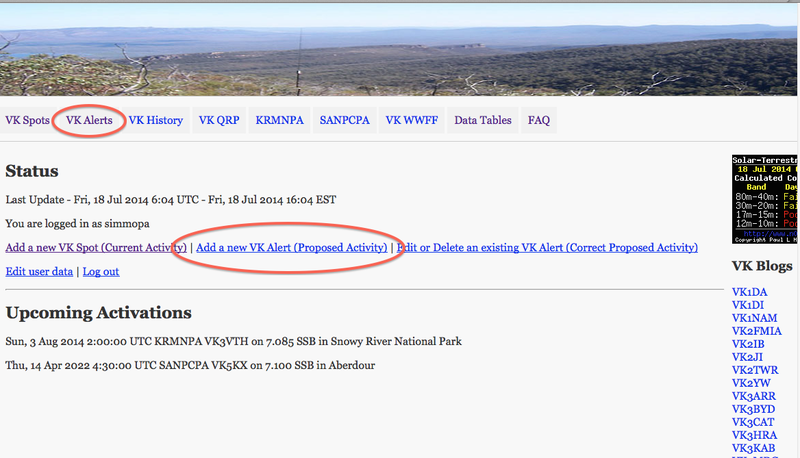 So that was a bonus: a SOTA, KRMNPA, & WWFF contact. Peter had told me that Rob VK2QR was on a summit and was up on 7.118, so I quickly QSYd up the band and worked Rob who was a beautiful 5/9 signal, as always! Rob always has a great signal from his SOTA activations. This time Rob was sitting on the top of Yanky Ned Hill, VK2/ SW-026 in the Bondo State Forest. After speaking with Rob, I QSYd back down to 7.095 but in that short period of time, the frequency had become busy, so I moved up slightly to 7.105, where my first taker was dedicated parks hunter, Tim VK5AV in Mount Gambier, with a beautiful 5/9 signal. This was followed by a steady flow of callers from VK1, VK2, VK3, VK4, VK5, and VK7. I was very surprised to be called by George VK4GSF at Toowoomba. George runs low power and was a good 5/5 copy into Kenneth Stirling, and I received a 5/7 signal report back. I also worked a handful of QRP operators including Peter VK3PF on 5 watts, Peter VK3TKK, and Col VK5HCF. It was also good to get Nigel in the log, VK2PHA who was mobile, crossing the Hawkesbury River. After operating on 40m for just a little over an hour, I headed up to 20m and managed to find a clear spot on 14.237. After just a few CQ calls, I heard KJ6PNF come back to me. But sadly, another very strong USA station came up just 1 kc away. There is a group of VKs and USA fellas that come up on 20m every day on or around 14.240 and it was evident they were not going to move for anyone. So that was the end of that. I moved up to 14.245 and started calling CQ again and was greeted by Paul VK2HDX in Sydney, who was using a Magentic loop antenna, with a terrific 5/9 signal. Paul was kind enough to spot me on the DX cluster, and as a result I worked a few Europeans: Slovenia, Italy, Switzerland, Belgium, Poland, Spain, Sweden, and Russia. This included my old mate Marnix OP7M, who I will be staying with in a few weeks time during my trip to Europe. The sun was starting to go down and it was getting a little chilly, so it was time to pack up and head for home. Again, this was a very enjoyable afternoon in the Kenneth Stirling Conservation Park. I and a total of 43 contacts in the log. Peter VK3PF; Matt VK1MA/3 (SOTA); Rob VK2QR/p (SOTA); Tim VK5AV; Rod VK5VRB; Les VK5KLV; Bernard VK3AMB; Brian VK5FMID; Richard VK5ZRY; Peter VK2MDZ; Peter VK3TKK; Ian VK5IS; George VK4GSF; Paul VK7CC; Arno VK5ZAR; Col VK5HCF; Tom VK5EE; Phil VK3BHR; Andrew VK1NAM; Tony VK3VTH/p; Albert VK3KLB; Ton y VK3CAT; Barry VK5BW; Hans VK5YX; Steve VK3JY/p; Nigel VK2PHA/m; Ron VK3VBC; and John VK5NJ. Paul VK2HDX; Albert S58AL; Max IK1GPG; IK7CMY; Vince HB9EVJ; Marnix OP7M; S52KM; SP5INQ; John ON7ZM; EA4DTV; SM7LPY; Alan VK4NAI; UA9LT; Ted VK6NTE; and Paul EA5/GM0OPK. I received the following certificate today via e-mail after applying on line, on the WWFF LogSearch facility. 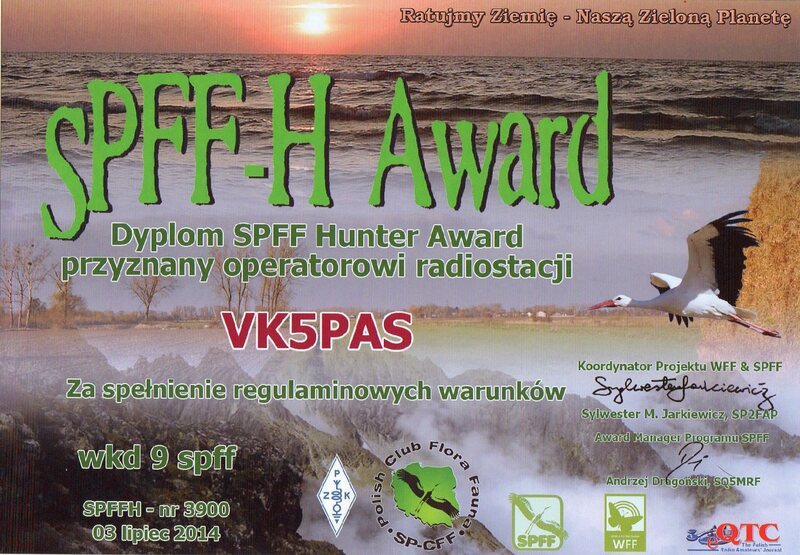 It is the SPFF-H Award, issued by the SPPFF-Polska Flora Fauna program. It is another of the many National awards available in the World Wide Flora Fauna program. The basic SPFF-H award is issued for communications with 3 different SPFF areas. For each subsequent three SPFF areas, yields a higher class of award. More information on the SPFF awards can be found at….. 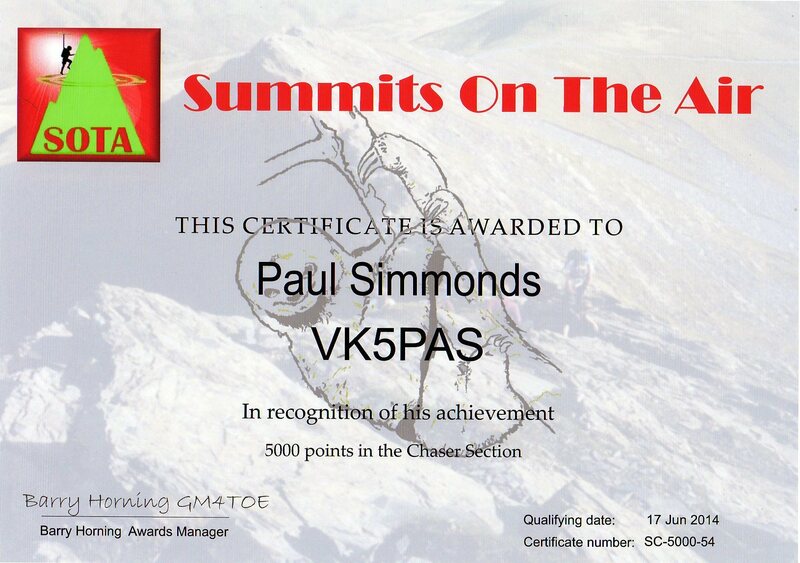 Thanks to some devoted Summits on the Air (SOTA) activators, back in June I went over the 5,000 point mark as a SOTA chaser. I applied for my certificate a few weeks ago and it was sent through via email from the United Kingdom today. It was interesting to check some of my statistics on the SOTA database. 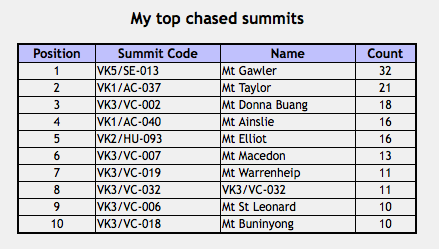 My top chased summit was nearby Mount Gawler, VK5/ SE-013, mostly thanks to Mr. Mount Gawler himself, Nigel VK5NIG. 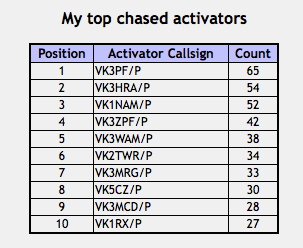 My top chased activator was Peter VK3PF, followed by Allen VK3HRA, and then Andrew VK1NAM. Not too many VK5s in there! And I have worked a total of 25 different associations and a total of 67 regions. With many of those being in Europe. I’ve just managed the one contact into the United States of America.